Paying off student loans is never a laughing matter and for most people, the quicker those loan payments are gone the better. But how far would you go to rid yourself of the chains of debt? We wanted to know what some of the strangest things were that people had done to pay off their student debt and the stories don’t disappoint. 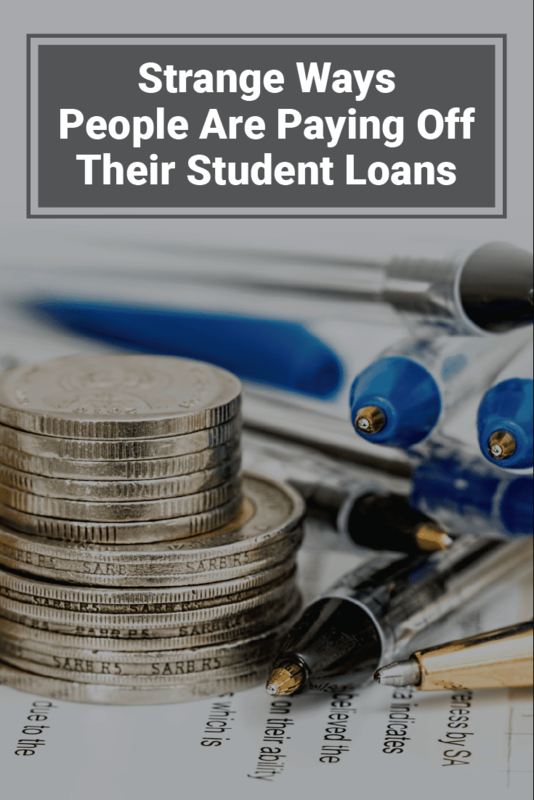 If you are looking for some inspiration on how to pay off your student loan debt using unconventional methods, then this post is for you. Let’s first start off with some of the responses received when we threw this question out into the interwebs. I paid off my student loans using a quite innovative method. Aside from transferring a specific amount each month to pay off the loan, I did another thing. For all purchases I made (say buy a banana for $0.50), I would round up to the nearest whole dollar and put the difference towards my student loans. I had an app from my bank that made it easy to transfer the small amounts to the account when I made a purchase. Transferring these small amounts made a huge difference in the end, yet I didn't really feel the effect on a day-to-day because of just how small the amounts were." Takeaway: Most people dream of large financial windfalls that will help that take care of their loans in one day. The truth however, is that every cent counts when paying off your debt. Adopting this mindset could help you pay off your loans quicker than expected if you are diligent about it. When I finished my MBA, I was $25,000 in debt. Also, I was having trouble finding a job. My uncle had a commercial mower for his property and we worked out a deal that I would cut his property in exchange for being able to use his mower. I did this for 3 summers and continued even after I found a job to solely help pay off my students loans-over $25k worth. Takeaway: Starting a side hustle to pay off debt is something we have discussed on the blog. What some may consider a bit “strange” about Gene’s story is that even though he had an MBA degree because he was so focussed on getting out of debt, he took up cutting lawns to make ends meet. Gene turned a negative story into a positive one by picking up the intensely exhausting side hustle of lawn mowing - even after he had secured a job - and dug himself out of $25,000 of debt. Zack McCullock from Your Money Your Freedom also shared a bit of his story. “My wife and I paid off our student loans (over $50,000) by living in a camper and minimizing our lifestyle. We sold our belongings, bought a camper on Craigslist, put our must-keep items in a storage unit and lived life simply for 11 months to become debt free. We survived a near direct hit from a tornado, ice-storms and Oklahoma’s brutally summer heat with no A/C. Takeaway: If you are not willing to/cannot live in a camper and brave harsh weather conditions, you don’t have to ! This was just Zack and his wife’s path to getting rid of student loan debt. A great takeaway from the their story however is the fact that they chose to live extremely frugally for 11 months - a short-term sacrifice - so they could enjoy a lifetime ahead of them free of $50,000 in student loan debt. Believe it or not, there are apps and websites that will help you pay down your student loan debt. Givling is one of them. Givling is an app where you play trivia games, interact with ads and get “Queue” points that can determine your virtual “place in line” to have your loans paid off. You can download the app on your phone, and you can have thousands potentially paid off your student loans. Here's how it works. You get two free chances per day to play the trivia game. You will answer as many questions as you can correctly until you strike out (get 3 questions wrong). Obviously, the more questions you answer correctly, the higher you score. The higher your score, the greater your changes of ending up in the Live Funding Queue that gets their loans paid off. 60% of those in the Live Funding Queue are active high scorers whereas the other 40% given a chance to "jump the line" via a random draw. After your trivia game has ended, you will be prompted to interact with in-app ads - this is how Givling gets "crowdfunded." Givling then takes a portion of those earnings and puts it toward helping people pay off their loans. Interacting with the ads also earns you points. You can also earn extra points in the app by inviting friends to play there game or buying a featured Givling artist product or service. 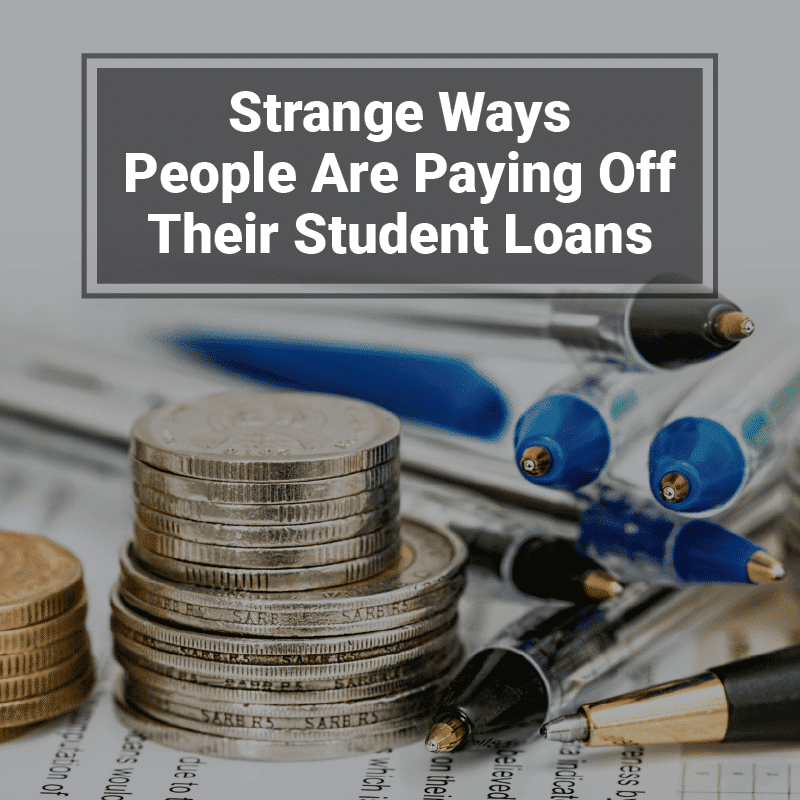 So there you have it - from playing trivia games to braving tornadoes so that student loans can be paid off - people will do anything no matter how “interesting” or “strange” in order to pay off their student loans. I hope it will spark some ideas for you. Have you done something that was extreme in the quest to pay off your student debt?